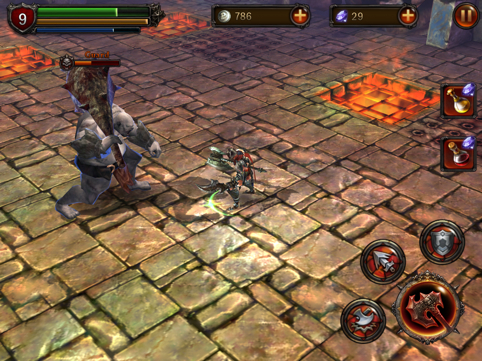 Conquer the Demon Towers and score free gems with this creature-slashing guide. 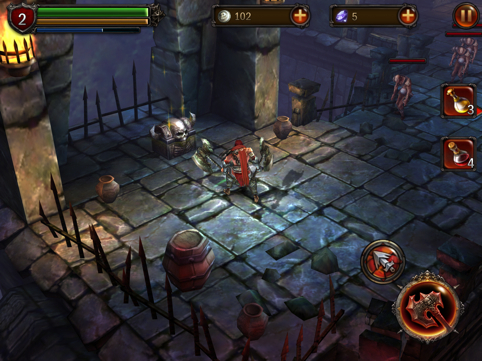 Skeletons, zombies and spiders are but three enemies that'll seek to make life difficult in Glu Mobile's enjoyable dungeon crawler, Eternity Warriors 2 for iOS and Android. It's the type of hack-and-slash adventure where, if you're not careful, swarms of baddies will overrun your axe-wielding warrior in a hurry, and without mercy. That said, don't become a permanent resident of the Undead Spire. Just use this Eternity Warriors 2 cheats and tips guide to crush those nasty monsters and score every last bit of loot. If you have even the slightest bit of interest in making it to the tougher stages, especially the punishing Spider Lair, you'll need the best gear for the job. 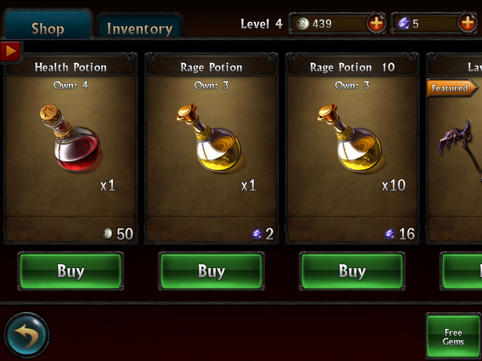 You can replay easier levels in the hope of finding some all-powerful weapon, or you can just buy it outright with lots of Gems (Credits in the Android version) and Coins. 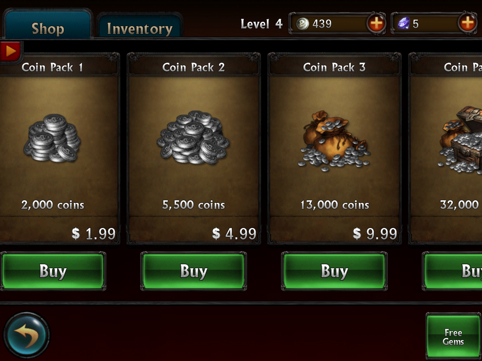 That said, behold the path to glory through in-app purchase. Glu Mobile is more than happy to supply you with some free Gems and Credits to aid in your fight against the demon horde. How many you receive depends on how far you're willing to go. On the Android side, you can sign up to become a VIP and score 50 or 260 Credits for choosing Silver or Gold, respectively. We don't care if you have the mightiest weapon in the entire game. Some monsters, when killed, drop loot, and it's in your best interest to pick it up. You may never use it, but who cares? You can always sell it for a modest amount of coins. 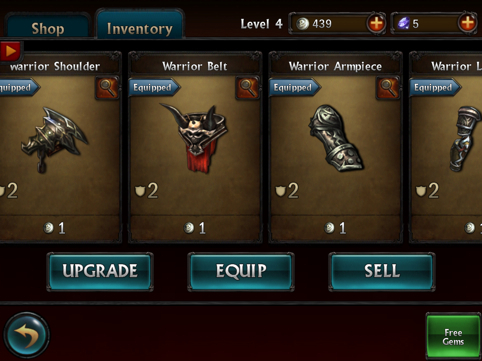 That said, always sell unwanted gear, especially if it's weaker than your hero's current equipment. You'll know if it's weak if there's a red arrow pointing downward to the right of the weapon or item's number, suggesting that it's inferior to what the character presently carries. Eternity Warriors 2 grows progressively tougher the further you advance, to the point where monsters become impossible to kill. That is, unless you have crazy powerful weapons and equipment. With this in mind, always look to equip the best gear at all times, either by switching or upgrading the current item, but beware. When it comes to upgrading a weapon, unless you're willing to part with some gems for a 100 percent guarantee, spending coins may not result in a successful upgrade unless you also have an Element in your inventory. We've mentioned this before, but it's important enough to warrant a section. Your hero can wear helms, belts, leggings, arm pieces and shoulder bling, all of which make him more powerful and therefore tougher to kill. So while your first thought will probably involve upgrading the shiny new Ghost Axe, remember to play dress up afterwards. Throughout your travels, you'll happen upon giant stone heads with green-glowing platforms. Standing on one of these platforms will refill your hero's health bar completely; it's a one-time use. We prefer to take advantage of it while preserving our health potions. You, on the other hand, may decide to fall back on one when all health potions have been used. A good strategy either way. The last thing you need is to reach a level's boss without potions, especially health. Do yourself a favor and buy several before heading into combat, though you also have the option of buying more in game. 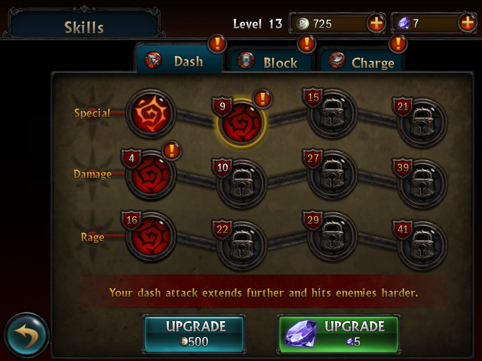 Always seek to upgrade the hero's Dash, Block and Charge maneuvers to make them more effective in a fight. Each move features upgrades spread across three categories (Special, Damage, Rage) that help transform the warrior into a more efficient killing machine. Consider the Block move's first tier. Upgrading Special releases a Blade Wave after parrying a melee attack. Upgrading Damage results in parry attacks dealing an extra 30 percent weapon damage. Finally, Rage decreases Block rage cost by 20 percent. What about Charge? Tier one Special produces a Destruction Wave that stuns targets for five seconds. Tier one Damage increases destruction wave damage by 35 percent, and tier one Rage decreases rage cost by 15 percent. 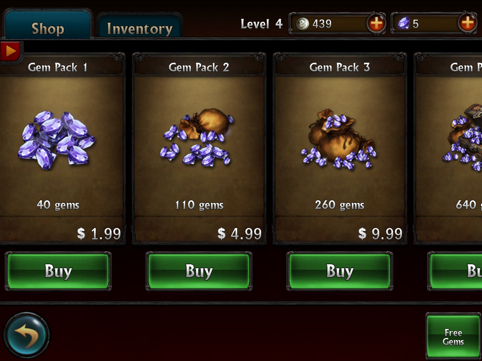 Remember that you'll need coins or gems/credits to do this, and upgrades get more expensive as you go. Eternity Warriors 2 comes with 84 different quests to complete, and what's really cool about this is the simple fact that you'll earn rewards along the way, anywhere from 50 to 1,500 coins for the trouble. The game even tracks your progress. On that note, keep an eye on the current list by selecting Quests from the main menu. Blue named weapons are better than white named weapons. Orange named weapons make up the rarest loot. Spider Lair and Hellfire Dungeons produce better loot. You must finish a floor to collect loot. Rate the game to earn five free Glu Credits/Gems. 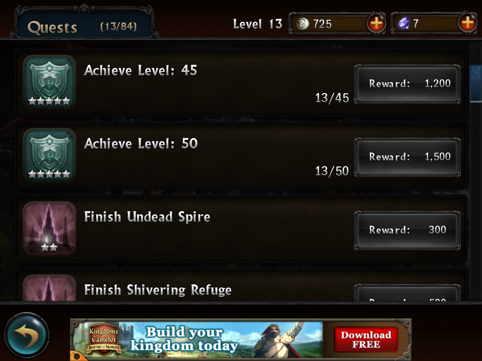 Upon death, you can give up and lose all collected loot for that level, or revive with Credits/Gems. 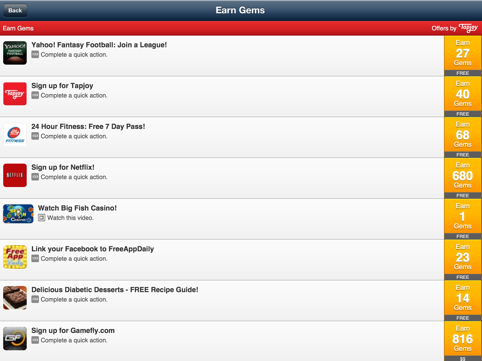 You receive a Daily Bonus for playing Eternity Warriors 2. 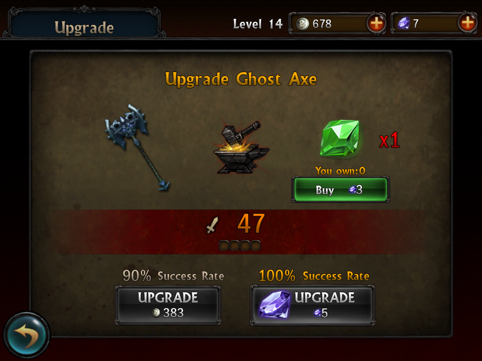 Gems guarantee success when upgrading weapons. Don't stand over fire pits. Always remember to block. This proves useful for parrying attacks, then counterattacking. Break all pots and barrels, while opening treasure chests to find coins. You can hit enemies when they are on the ground. 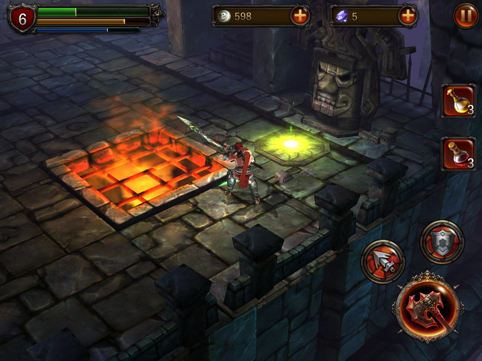 It's easier to complete dungeons with a buddy via online co-op. 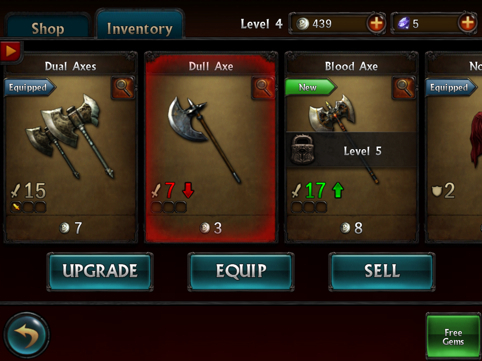 Before starting a level, highlight the desired stage and check to see the recommended weapon.